As on other platforms, Métro for Android is free to use. In exchange, we count on your help to make the software better, by notifying us of updates and reporting changes in your transportation network. Alternatively, you may send us a donation. The development of Métro for Android is now discontinued. The latest (alpha) release available here may be incompatible with recent devices (especially those lacking a menu button). 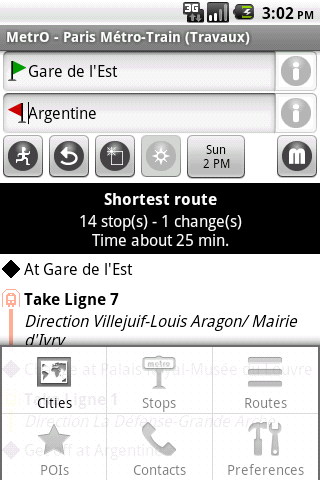 Métro runs on any Android smartphone or tablet with system version 1.6 ("Donut") or later. Métro is not available (yet) on Google Play (a.k.a. the Android Market). Consquently, to install the app, you will first have to enable "third-party app installation" in the "developper" settings on your phone (for instructions, see here, for example). You can then download the application package (version 0.3.0) here and install it manually on your device. On some devices and/or with some versions of Android, a click on the download link above will have no effect. When it happens, press on the link until a menu pops up and select the "open" option. If you open the download link directly on your device, you may be prompted to install the software. In that case, just follow the instructions until the setup succeeds. If you downloaded the "apk" package on a desktop PC, first transfer it to your device, using your USB connection, to a directory of your choice (for example "/download"). If you transfered the "apk" package from a desktop PC or if your system has not automatically prompted you for installation, you then need to install a file manager on your device. I recommend OI File Manager. With this tool, open the "/download" directory (or the one you chose to store your copy of the "apk" package) and "click" on the "MetrO.apk" file to run the installation. The app is currently optimized only for "standard" screen sizes (320x480 pixels) but should not have any problem with other sizes and densities, except for sub-optimal graphics. On the first launch, you will see the city list panel and you will be invited to connect to the Internet to load the current list. After you have installed some cities, they will appear in the list with a green robot icon, whereas the other available cities ares shown with a lightning icon (they will require an Internet connection to be loaded). Whenever possible, the files will be saved on the memory card. The buttons let you switch between the complete list and a list of the cities present on your device, while the last one ("Update all") checks for updates on all the files you have already installed. Besides other options available on a long press (discover them for yourself), you can download (if necessary) and open a city by simply pressing on its name. The main screen, where you can find a route in the selected city, will now appear. Note that the last city you have opened will be automatically loaded when you restart the app. You should now see the familiar text fields where you can enter your starting point and your destination. After you type 3 letters, a list of suggested matches will be shown, where you can select the stop or POI you are looking for. In cities where stop locations are available, you can also query a route from/to a street address. Just enter the address instead of a stop name, the app will ask if it should try to locate it and, if you confirm, you'll get your door-to-door advice. Of course, locating an address requires an Internet connection but the app keeps the 20 last used to make it easier and faster to use with your favorite places. In these cities, you can also search a route from/to your current position: set the focus on the origin or arrival text field and press the compass-like button. Press the "Go" button and your route will appear. Among the features that are available in this release, the day and time button lets you change ... the day and time of your planned trip. Now, if you open the menu, you will notice that there is still some work to do. The first option that is presently active is the one ("Cities") that gets you back to the list of cities, where you will be able to load a new one or check for updates. Set the maximum distance to search for stops around your position or a street address. Select whether to display the quickest route or the one with the least number of connections first in the results. The other options will be implemented at a later time. 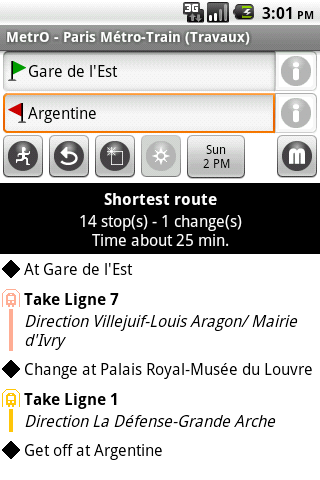 A few errors and bugs may still be present in the current version of Métro for Android. Please contact us if you encounter any issue. Of course, many features are still missing in this early release. Please rest assured that we will add these as soon as we get some time to work on the app. Copyright © 1997-2015 Kinevia SARL. All rights reserved.